Video Highlights: Potts' 19 leads San Beda past Lyceum 91-86 (NCAA Season 92 - June 28, 2016) - Balita Boss! 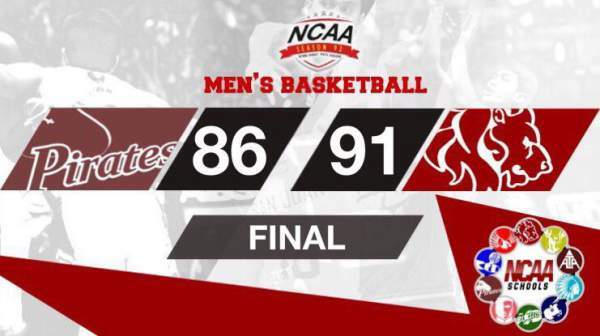 Davon Potts led San Beda College Red Lions past Lyceum of the Philippines University Pirates, 91-86, in the NCAA 92 Senior Men’s Basketball Tournament. The rookie from California scored 19 points, 12 of which came in the final quarter. Dan Sara had 14 pints, five rebounds, and five assists, and Javee Mocon had a double-double of 11 points and 13 boards for the Red Lions. Wilson Baltazar paced the Pirates, vwho suffered another heartbreaking defeat, with a game-high 24 points. SAN BEDA 91 - Potts 19, Sara 14, Noah 12, Mocon 11, Tankoua 10, Bolick 8, Presibitero 7, Tongco 6, Navaro 2, Soberano 2, Adamos 0, Carlos 0, Oftana 0. LYCEUM 86 - Baltazar 24, Nzeusseu 18, Ayaay 12, Marata 11, Alanes 9, Alban 4, Serafico 4, Bulawan 2, Soliman 2, Malabanan 0, Magbuhos 0.